So who is thinking about the man who will bring us all a warm and happy feeling of cheer on Christmas Day? No, I don’t mean the man behind the counter at Threshers. Santa Claus didn’t visit the baby Jesus in the manger, but you’ve probably remembered that bit. So had Reverend Paul Nedergaard, who upset the citizens of Copenhagen in 1958 by reminding them that he was a ‘pagan goblin’. Rev. Nedergaard may not have had career prospects in diplomacy, but he was right. Santa/Father Christmas is an American/European syncrasy derived ultimately from pagan origins. He started out with a green cozzie, which gives a hint. He seems originally to have been a kind of trickster figure – the Fool, Mischief – a representation of the capricious elements of nature – appropriate, given that he appeared at the most bleak time of year. The role of the Fool, in folkore as in a court, could be frightening and disobedient. But this danger came with wisdom and a mandate to say that which others daren’t. The Roman winter feast of Saturnalia hinted at the same reversal/conflation of diifferent social roles. 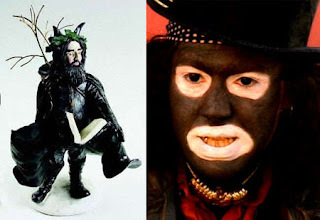 In Holland, Santa is accompanied by Knecht Ruprecht, or Black Peter. He’s often played by a man with a blackened face. I can’t help but see the resemblance. What do you think? 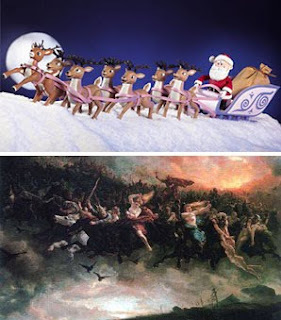 Jacob Grimm thought that the Odin gave out a cry of “ho, ho ho” as he led the Wild Hunt across the European skies, quite often in the spring or autumn, but most often at Yule – the twelve day pagan midwinter feast. The Hunt is preceded by the sound of baying, barking and shouting. Then a rider on a horse erupts onto the scene, thundering through the air followed by a host of strange spirits. The rider is often black, sometimes headless and sometimes (especially in Germany) bears the battle-wounds that would have caused his mortal demise. Fire spurts from the mouths and noses of the phantom horses and hounds which are often only two or three legged. And sometimes, the spirits of the recently dead are seen in the infernal train. Would you leave mince pies and beer out for such entities? You should. In folkore, as in life, attempts to mollify the dangerous can start with prezzies. Sheaves of grain were left out for Odin’s mounts. In a tough environment, such a gesture was also a statement of faith that things will get better. Not breathing fire, but in charge of lugging the Christmas Spirit around, Rudolph was created for the Montgomery Ward group of stores in 1939.